Check in time is 2.00 pm. This is to give the cleaners sufficient time to have your room ready. If you would like to check in earlier this can be arranged on request, so we can try to have your room ready. Please let us know and we will let you know the key pick up details and have your room ready. Yes we have 2 medium sized washing machines, 2 dryers and clothes lines and pegs all available free of charge, however you will need to purchase your own washing powder (we have powder available for purchase at reception). Yes, guests enjoy free High Speed Wi-Fi access at Takapuna motor lodge. We believe Wi-Fi is a necessity in this day and age and understand our customers need to stay connected 24/7. How often do you service the rooms for long term stays? Do you have disability units? No, but we can provide steps to help you into the shower/bath. 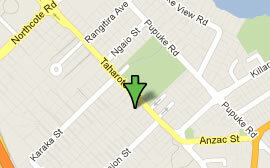 We are 5-10 minutes walk from the local supermarket and 15 minutes walk from Takapuna town centre. How heated is your pool? It is set at a tepid / luke warm temperature. Our hot tub is around 40º C.
Flexible Rate Bookings: If cancelled or modified up to 24 hours before the date of arrival, no fee will be charged, . If cancelled or modified later or in case of no-show, 100 percent of the total booking will be charged. Do you have day rooms? No, our rooms need to rent for a full night as they are cleaned only once a day between 9am – 2pm. Yes, a menu can be filled out the night prior. We provide a continental, light cooked and full cooked breakfast ranging between $13-$18 . Do you do long term rates? We provide a lot of longer term "transitional" accommodation so please contact us and depending on availability we will be able to give you a competitive rate.